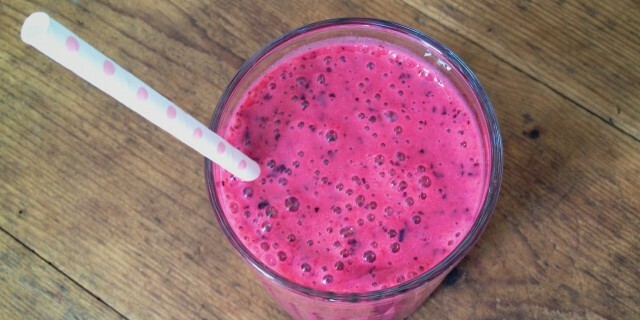 This Silky Smooth Pink Smoothie makes an amazing lunch. You won’t believe how creamy and delicious this smoothie is. This Silky Smooth Pink Smoothie makes an amazing lunch, breakfast or post-workout smoothie. You won’t believe how creamy and delicious this smoothie is. The avocado and banana give this smoothie the lovely creamy texture but they also help to make it filling enough for a satisfying meal. If you are struggling with green smoothies, this slightly sweet and fruity smoothie is a great way ease yourself into making your own smoothies. This Silky Smooth Pink Smoothie also makes a great post-workout smoothie with easily digestible carbs, healthy fats and plant-based protein. It helps you to replenish your muscles and to stay fit. Instead of the flax seeds and hemp seeds, you can also use a few tablespoons of a plant-based protein powder, for instance Vega’s Performance Protein in Berry or Vanilla or Sun Warrior’s Warrior Blend in Vanilla. Combine the ingredients listed above into a high-speed blender. The higher the speed the creamier and more delicious this smoothie will be. Add more almond milk to thin as desired.